FINAL SPACING: Do not plant, unless way out on the farm or ranch by a creek or river. NATURAL HABITAT AND PREFERRED SITE: Eastern 1/2 to 2/3 of the state, primarily in river and creek bottoms in deeper soils but adapts fairly well to a variety of soils. IDENTIFICATION INFORMATION: Sycamore is a large-growing tree with large, papery leaves, distinctive bark that flakes off leaving a white smooth underbark and round seed pods in the fall. Fall color is nondescript, basically brown. FLOWERS AND FRUIT: Flowers appear in the spring, April to May, separate non-attractive flowers on the same tree (monoecious). Flowers are borne in dense round clusters about ½ inch in diameter on short stalks. Fruit ripens in the fall – September to October. It is round, 1 to 1 ½ inch diameter, light brown, on long stems 3 to 6 inches long. BARK: Bark is quite distinctive. It is greenish cream to white, sometimes marked with patches of dark green or brown at first, later flaking off to reveal lighter layers of younger bark. Older trunks are often roughened and fissured. Sycamore has the most spectacular bark of all trees in the winter. 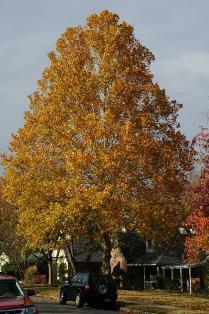 FOLIAGE: Leaves are simple, alternate, deciduous, poorly yellow in the fall. They are large, 4 to 12 inches across. They are medium green in the summer paler and hairier on the underside, yellow to brown in the fall, a maintenance problem because they blow around like paper and don’t decay very quickly at all. 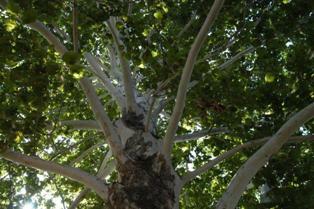 CULTURE: Sycamore are easy to grow into big trees in short periods of time if the diseases don’t hit. They respond to fertilizer but don’t need much. They do need plenty of water. PROBLEMS: Many. Anthracnose, a disease that attacks the leaves and young twigs, is the most commonly referred to but it is not the most serious disease. Bacterial leaf scorch is more serious. It kills large sections of the tree and eventually the entire plant. Lacebugs can also be a problem during the growing season. The Sick Tree Treatment and the long term Basic Organic Program can keep sycamore trees more healthy than any other approach. Long term sycamore is not a good tree choice unless you like aphids, scale, bagworms, borers and lots of dead limbs falling out of the tree, and short-lived trees. PROPAGATION: Why would you want to? If you must, seed can over winter on the tree and be planted in the spring, will germinate readily. Early harvested seed must be stratified for at least 30 days at 41 degrees before planting in the spring. Sycamore will also root from dormant hardwood or softwood cuttings if kept under a mist. 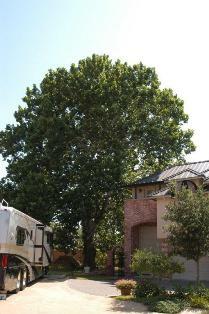 INSIGHT: Some of the landscape architects in Texas have continued to try to use this plant or its close relatives such as the Plane tree or various hybrids. None of them are any good or should be designed into any residential or commercial projects. Very poor tree choice for landscape use. 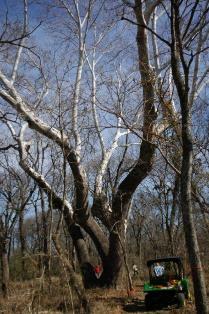 It is a shame this plant is so problematic because the white bark in the winter is spectacular.